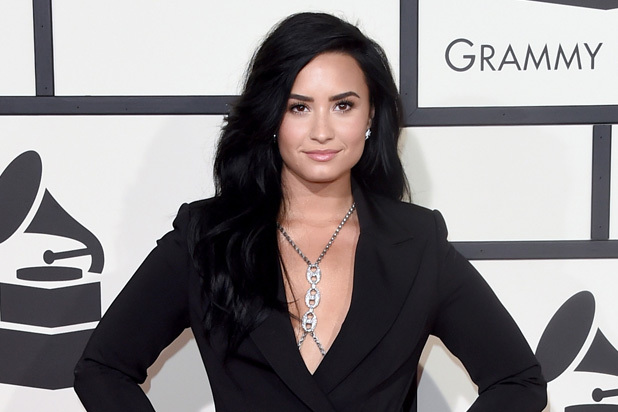 The singer Demi Lovato is flying higher after her "Confident" earns her dream nomination at 59th Grammy Awards. It's Demi's first ever selection for any categories at one of the most prestigious awards and she just can't contain her excitement she has received after landing herself at the Grammy. The “Heart Attack” star seems to be achieving a milestone in her music career on December, 6, 2016 when it was announced that Demi Lovato has scored an important mention for her latest album in the category of "Best Pop Vocal Album". Her "Confident" was released in 2015 which not only became a hit but also attached the selection committee at Grammy for honoring her with an important category. The singer took to her social media account to express what she was feeling after being informed about her nomination. She revealed she woke up with the most amazing news of her life. She also thanked Recording Academy for the Grammy nominations. It will be a different story of a tough competition among all names of the same category where Demi is nominated for her album. Besides Adele and Justin Bieber, the 24-year-old will be struggling with Sia and Ariana Grande. However, it is really an honor for her that Recording Academy Officials have recognized her work. Demi says she still cannot believe that she has been nominated for a Grammy. And no one can have an idea of how unbelievably thankful and glad she is for this honor. She reveals that the Grammy nomination was a dream of the singer that seems to come true for her. She was spotted vowing to catch the attention of the officials at the Recording Academy during the ceremony of the Grammy Awards for 2015. It was almost eight months before she hadn't release her album "Confident"
According to the singer, she has never been much confident in her sound, and never has felt this hunger before. She posted on Twitter at that time writing "authentic" is the only word that's coming to her mind and she doesn't know what she can say if this is her best ever work. She is willing to bring more music that has the power to appeal to the masses so that it can become hit and get her in the eyes of selections committee at the biggest awards. According to the star, this nomination has opened a new chapter for her like and she is fully ready for it. Like her album’s title, Demi is confident to win the Grammy but for now she is taking it the best ever opportunity to being honored with a nomination. Following the Grammy news, the singer also received ample of wishes from her friends, fans and colleagues from all across the world who also congratulated her for receiving a mention at the awards. Interestingly, the first ever person who congratulated Demi for her hard work was her ex-boyfriend who has been very close to her. Joe Jonas took to Twitter and posted a message saying he is so proud of Lovato and her nomination at Grammy. He said it’s really huge and she undoubtedly deserves it.